Join now and start earning free nights. Texas-crafted spirits and microbrews give Happy Hour homespun appeal. Our bright, modern meeting spaces come with a bonus: Alamo views. 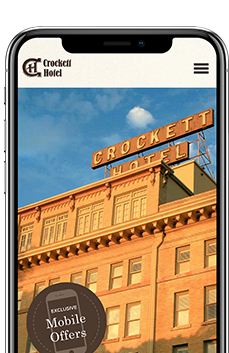 Offering unmatched access to San Antonio’s most important attractions and landmarks, the Crockett makes city exploring easy. From the Alamo to River Walk and the Spanish colonial missions beyond, see and savor it all from your San Antonio home base. exclusive specials and offers from 1859 Historic Hotels. 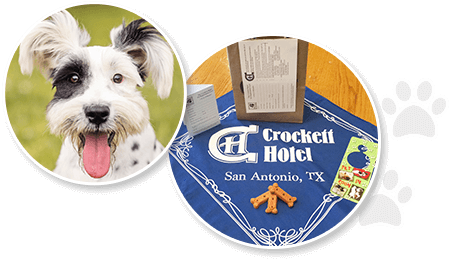 At the Crockett Hotel, there's no need to leave your four-legged family members behind! Book our Furry Friends Offer that covers the pet fee and receive perks that you and your pets will appreciate! Pet Policy: $60 per pet, per stay. Family adventures are more fun at the Crockett Hotel! We warmly welcome your four-legged friends to the Crockett Hotel. Download our brand new complimentary app now and begin planning your San Antonio escape! Compatible with iPhone, iPad and Android Devices, and ideal for simplifying your busy schedule. 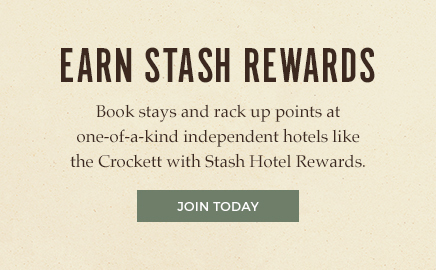 We look forward to welcoming you at the Crockett Hotel! 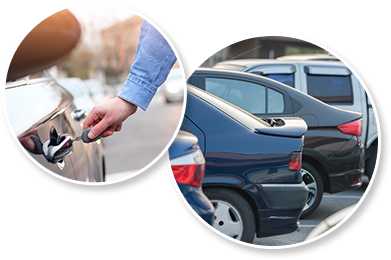 Valet and self-parking are available at $28 per day + tax with in/out privileges.